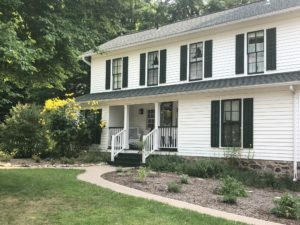 to our Waupaca, WI, Bed and Breakfast! 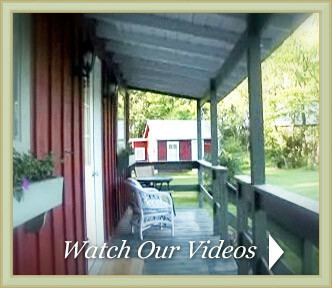 Crystal River Inn is an 1853 farmstead turned Bed & Breakfast over 30 years ago. 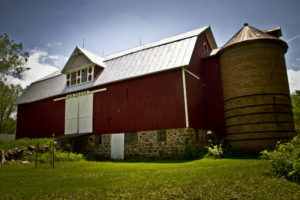 We are located in the quaint and historic village of Rural just minutes from Waupaca, Wisconsin and the Chain of Lakes. The Inn sits on the banks of the Crystal River with the river peacefully flowing and winding throughout the village. 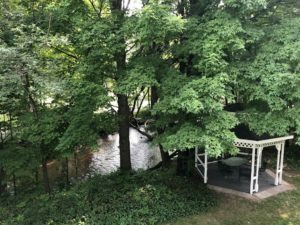 The Inn offers six guest rooms with antique furnishings, a view of the river and/or woods, and a nook for reading or visiting. Guest rooms include private baths and most rooms include a fireplace. Two first floor rooms each have a private entrance and a double whirlpool tub. 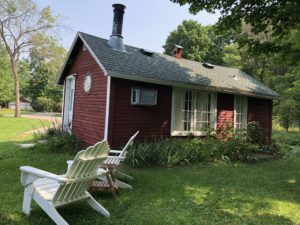 Crystal River Cottages are located on our 11.5 acre property. 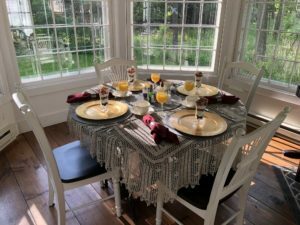 Breakfast is included for guests staying in cottages. 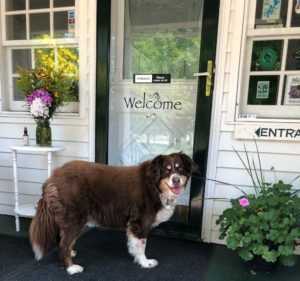 We welcome children and well behaved dogs ($25 Pet Fee) in our cottages. Complimentary WIFI is available in the cottages. 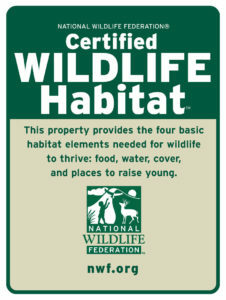 Guests are invited to wander the 11.5 acres of the property which is a certified Wildlife Habitat. 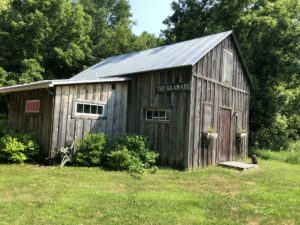 You’ll see an abundance of wildlife, short and tall grass prairies, walking paths through native plant gardens and woods, a mowed Labyrinth, historic barns and an Artisan well. We are Travel Green Wisconsin certified and brew only organic, fair trade coffee and teas. We serve fresh vegetables and fruit from our garden and organic farm fresh eggs, bacon and maple syrup. We’re pleased to cater to special diets, i.e. gluten free and vegetarian. The multi-course breakfast is served in our dining room which overlooks the Crystal River. The Crystal River Inn is your perfect destination for outdoor weddings. Wedding ceremonies are held in the gazebo with the Crystal River in the backdrop as you say your vows. Outdoor receptions are held on the grounds for guests to enjoy the natural beauty and history. We can accomodate weddings up to 150 guests. Kayak Rental is available and includes life jackets and complimentary transportation for $25/day. Please reserve kayaks in advance for guaranteed availability. Paddling is fun in Waupaca with both flat water or moving water for the ultimate paddling adventure. The Chain O’ Lake has 22 interconnected lakes with crystal clear spring fed waters. The Chain’s marl bottom gives many of the lakes a distinctive blue green coloration not found in many other bodies of water in Wisconsin. The Crystal River is narrow, winding and scenic with crystal clear water for both a relaxing paddle and a little adventure with rapids. 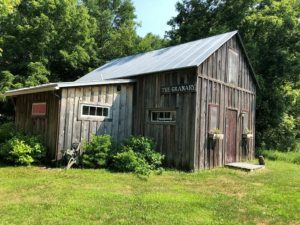 The Innkeepers favorite route is about a 3 hour paddle and starts in Marl Lake (we provide complimentary transportation and a map of the route), explore clear small lakes and streams that lead to the Chain O’ Lakes. Long Lake flows into the mouth of the Crystal River. You’re paddle will bring you right back to the Crystal River Inn. We welcome you to feel at home and create memories of an unforgettable experience. There are so many ways to enjoy nature Hartman Creek State Park and Rustic roads for biking and hiking and the Chain O’Lakes for boating, kayaking/canoeing and swimming. 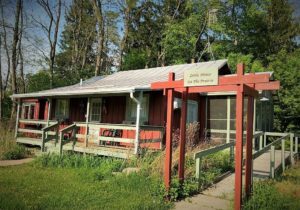 The Waupaca area has many shops and excellent restaurants. In the Inn and grounds you’ll find cozy places to sit and read or just be. You may purchase gift certificates online – see “Reservations” or give us a call. We welcome you to feel at home and create memories of an unforgettable experience! 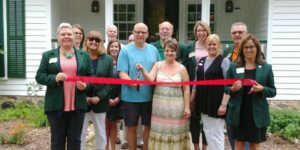 The Crystal River Inn's Innkeepers, Paul & Shayna Cappelle, celebrated the official ribbon cutting as new owners in June 2018 with the Waupaca Area Chamber of Commerce.